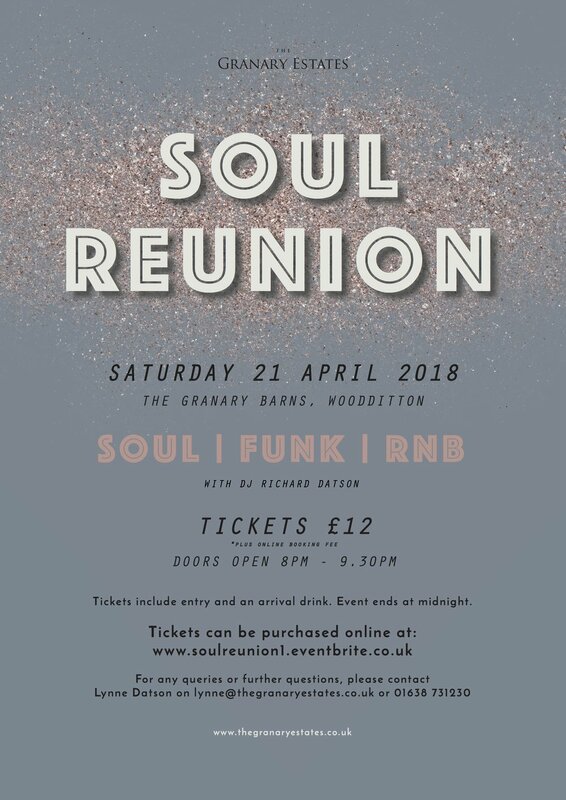 Soul Reunion is back for 2018! If you like classic hits from the 70's, 80's and 90's, this is the night for you! With local DJ Richard Datson behind the decks, nostalgia, fun and good times are top of the list as we invite you to the barns to dance the night away to some of the best music ever made! At just £12 per person, tickets include an entry fee and a complimentary drink on arrival. Doors will be open from 8-9.30pm and the event will finish at 00.30am - we would highly recommend pre-booking taxis if you need transport home from the venue (our postcode is CB8 9RZ). The event is for Over 18's only. Always a popular night, tickets have began selling fast so get yours now to avoid disappointment! Bring on the boozin', schmoozin' and groovin'!